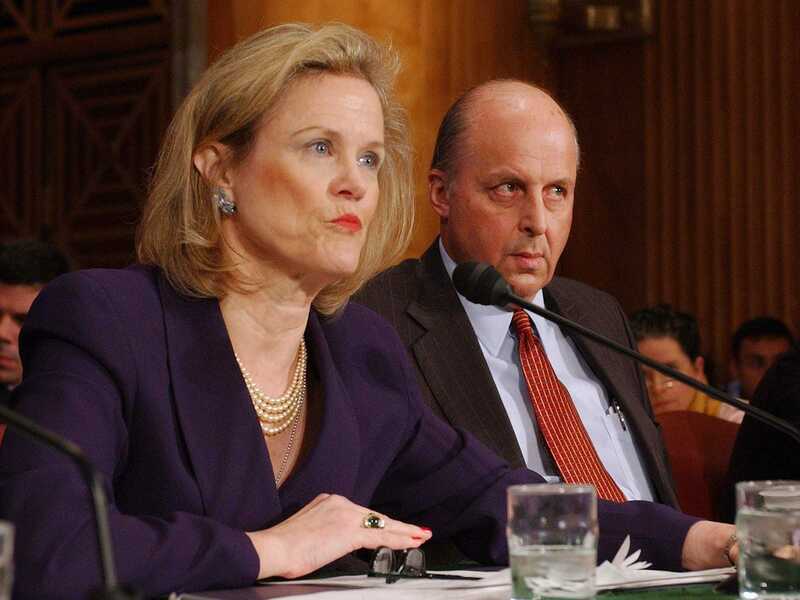 AP/Dennis CookIn this April 7, 2004 file photo, Robin Raphel, coordinator of the State Department’s Office of Iraq Reconstruction, discusses the U. N.’s Oil for Food Program on Capitol Hill. An intercepted conversation of a Pakistani official spurred the high-profile investigation of a veteran diplomat, according to a front-page New York Times report Friday. The report, citing unnamed officials, did not specify the details of that conversation and the diplomat, Robin Raphel, has not been accused of a crime. However, the investigation led to an FBI raid on her home last month, where authorities found classified information. That development stunned much of the foreign policy establishment, in which Raphel is a fixture and one of the highest-ranking female diplomats. A former ambassador and assistant secretary of state for South Asian affair, Raphel was considered one of the foremost experts on Pakistan. Raphel’s spokesman has said that she has not been told by authorities that she’s being investigated. Another strange foreign policy incident is also linked to Raphel’s past. In 1988, Raphel’s former husband and then-ambassador to Pakistan, Arnold Raphel, died in a plane crash with the president of Pakistan, Gen. Mohammad Zia ul-Haq. “The cause of the crash was never determined, spawning numerous theories, including that it was an assassination and that nerve gas in a canister hidden in a crate of mangoes had been dispersed in the plane’s air-conditioning system,” the Times noted.